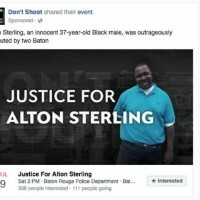 After the shooting of Alton Sterling at the Triple S convenience store on North Foster Drive in July 2016, protests broke out in front of the convenience store and at other points around Baton Rouge. Some protests were spontaneous, while others were well planned and organized. What few people knew at the time was that a small group of key African American leaders were meeting everyday throughout the protest. Their goal was to protest the killing of Sterling but also to make sure the protests did not turn violent. One of the African American leaders willing to speak on the record was businessman Cleve Dunn. During the protest, Dunn and others were quietly working to calm things down and keep everyone on both sides safe. The group often met at the Triple S.
“Baton Rouge is not like the places where they have experienced violent protests and wanton destruction of property. Our people are the ones hurt the worst when that occurs,” Dunn said. During the protests, Dunn and State Rep. Ted James were among black leaders invited to attend a meeting of the Ronald Reagan Newsmaker Luncheon sponsored by the Republican Party of East Baton Rouge Parish. Both groups wanted an open dialogue that made sure there were no big surprises. The media covered the meeting between African American leaders and Republicans, which was conducted in public at Café Américain on Jefferson Highway. Everything seemed to be going well — until something quite unexpected happened. A protest was called in front of Baton Rouge Police Department headquarters at the corner of Goodwood and Airline Highway. The black leaders who had been carefully organizing and monitoring the protests were caught by surprise. They had not called for the protest. Worse still, they didn’t know anything about it. As word spread about the protest, the concern of black leaders grew. A direct confrontation with the police was not something they wanted and certainly not in front of police headquarters where tensions would probably be high between police and protestors. Central City News reporter, Kim Powers, was in the midst of virtually all of the demonstrations, starting with the first one in front of the Triple S on North Foster Drive. Often she was the only white face on the scene. Yet, she was always treated courteously and with respect. Powers reported that during the first protest at Triple S, no uniformed Baton Rouge police officers were present, and it was unclear at first what direction things would take. Then a BRPD police unit drove up North Foster and paused in front of the Triple S.
A black youth pushed forward and threw a bottle at the vehicle. The crowd shouted at him not to do that! Then two black mothers grabbed the young man and set him straight. There would be nothing like that here, they told him in no uncertain terms. After that, the reporter said there were no more signs of violence at Triple S. Her only concern was the fact that some people were drinking and that could easily get out of control. As word of the planned protest in front of BRPD headquarters spread days later, African American leaders became uneasy. Who had called the protest? No one seemed to know. Rumors spread on social media like wildfire. The Black Muslims were coming. The Black Panthers were coming. In fact, bus loads of people did begin arriving. Cleve Dunn was among those who spoke out in the media, saying that outsiders weren’t needed or wanted in Baton Rouge. We have our issues in Baton Rouge, and we can handle them, Dunn said. Before the protest at BRPD protest, black leaders in Baton Rouge were employing a tactic at protests. If there were a confrontation between protestors and the police or with anyone else, they would be there to step between the parties and calm things down. When black leaders arrived, they saw protesters lined up in a long line facing off against the police. There was trash talk and obscenities. Worse still, the Baton Rouge leaders didn’t recognize these people. A few local people were mingled in but basically they were out-of-towners that no one knew and no one could control. Kim Powers was on the scene taking pictures and talking to people. Dwight Hudson, now a Republican Metro Councilman, was there too passing out bottled water to the protesters and trying to keep things friendly. As things began to get tense, once again, the black leaders including a number of black pastors began to walk the line between the protesters and the police, putting themselves in harm’s way as they did so. No one knew what would happen next. If a protester got out of hand, the pastor or other leader would step in front of him and tell him to back off. A few radical groups got on TV and tried to stir up passions, but the protests gradually slowed down. On Sunday, July 17, 2016, three Baton Rouge Police officers were assassinated by Gavin Eugene Long, a former Marine Corps sergeant who embraced a black separatist movement and at times claimed to be Muslim. The assassinations occurred on Airline Highway, just a few blocks from police headquarters. In 2018, the House Intelligence Committee asked Facebook to produce ads placed on Facebook by Russian intelligence agents during 2016. Facebook produced more than 3,500 ads that it believed to be placed by Russian intelligence. While the ads showed no evidence of collusion between the Russians and the Trump campaign, it did show a pattern of the Russians injecting themselves into a wide range of political disputes in the United States, always trying to stir the pot, make American politics more toxic, and turn Americans against one another. Among the ads was one which answered the question of Who was behind the protests at BRPD headquarters? 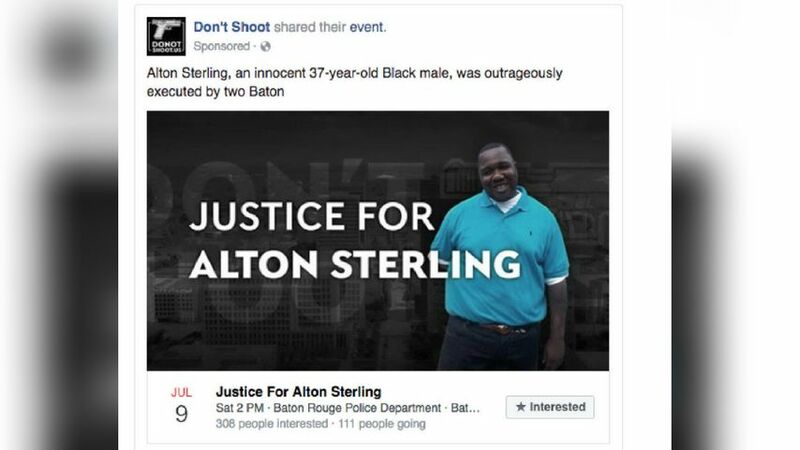 Russian intelligence purchased ads on July 9, picturing Alton Sterling and urging people to come to the rally in front of BRPD headquarters. The ad targeted people living in Louisiana. It was paid for in rubles online from Russia. The ad ran from July 6 to July 9, 2016. At least 111 people signed up on the Russians’ Event Page to attend the protest, and Facebook reported that 26,000 people saw the ad. Democrats on the House Intelligence Committee made the Facebook ads public. Baton Rouge leaders such as Cleve Dunn were shocked to learn of the Russians’ involvement. Local leaders had nothing to do with the protests at BRPD headquarters, except that they showed up to try to keep them peaceful, which they did, no thanks to the Russians. Now at least, the mystery of who was behind the protests in front of Baton Rouge Police headquarters in July 2016 has been solved. Yes, it was the Russians.